Aggressive periodontitis is a disease of periodontium occurring in a systemically healthy younger individuals characterized by rapid destruction of periodontal apparatus. This disease if left untreated in the early stage causes severe destruction of the alveolar bone surrounding the tooth ultimately resulting in the involvement of periapical region, thereby involving an endodontic component. The meticulous relationship between the pulp of the tooth and the surrounding periodontium was described in earlier times. The conscientiousness nature of the diseases and its further involvement of the pulp in a retrograde manner is always challenging for the operator to treat such infections as a result to completely eliminate the disease in terms of both periodontal and endodontic components. When this condition extends to the region of furcation, it becomes a challenge for the dentist to improve the prognosis of the tooth. With the advent involvement of pulp through the periodontium has left a doubt in the minds of the operator with regard to which has to be treated first. Therefore, the lesion involving endodontic and periodontal component has always caused confusion and controversy in dentistry. Hence, this case report describes diagnosis, treatment plan and the management of a tooth with primary periodontal lesion and secondary endodontic involvement. A 28-year-old female patient came to the hospital with a chief complaint of pain, pus discharge, and mobility on lower right back tooth region for the past 2 weeks. She did not have any history of systemic illness and smoking. Dental history revealed a tooth loss on her lower left back tooth region 6 months ago due to mobility and was not replaced. On intraoral examination, generalized pockets up to 8 mm were present with bleeding on probing. A very minimal plaque and calculus were present [Figure 1]a and [Figure 1]b. 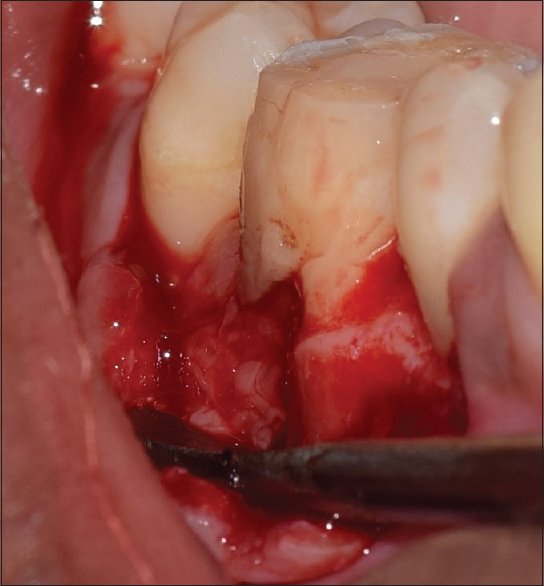 Considering 46, there was a deep periodontal pocket of 8 mm with pus discharge and with grade II mobility [Figure 2]. No signs of decay present in relation to 46. The tooth was nonvital on testing with both heat test and electric pulp tester. Probing with Naber's probe revealed grade II furcation involvement as per the Glickman's classification of furcation involvement. OPG reveals that there was a generalized vertical loss of alveolar bone with vertical loss present in all the posterior teeth [Figure 3]. Pertaining to 46, radiographic examination revealed radiolucency surrounding the distal root of 46 with furcation involvement and vertical bone loss up to apical third of the distal root of 46 [Figure 4]. Electronic pulp testing was done to check for the vitality of the tooth which confirmed that the tooth was nonvital. From the above mentioned findings, considering the American academy of periodontology international workshop for the classification of periodontal diseases, 1999, the case can be diagnosed with generalized aggressive periodontitis with primary periodontic and secondary endodontic lesion with respect to 46. Written informed consent was obtained from the patient prior to the beginning of the treatment. After initial phase I therapy, due to the nonvitality of the tooth, initially root canal treatment was done to 46 and review was made after a month to check for healing. When the site is probed, a 6 mm pocket was present with bleeding on probing. Hence, the treatment was aimed to do flap surgery of 46 and correct any osseous defects and also to regenerate the lost tissues. The area selected for surgery was anesthetized using a mixture of xylocaine with adrenaline 1:200,000. The first incision, sulcular incision was made extending from mesial end of 45 to distal end of 47. Following this, a vertical incision was made mesial to 45 and a full thickness periosteal flap was raised both on buccal and lingual aspect until the base of the defect. The affected area was debrided thoroughly using area-specific Gracey's curettes. 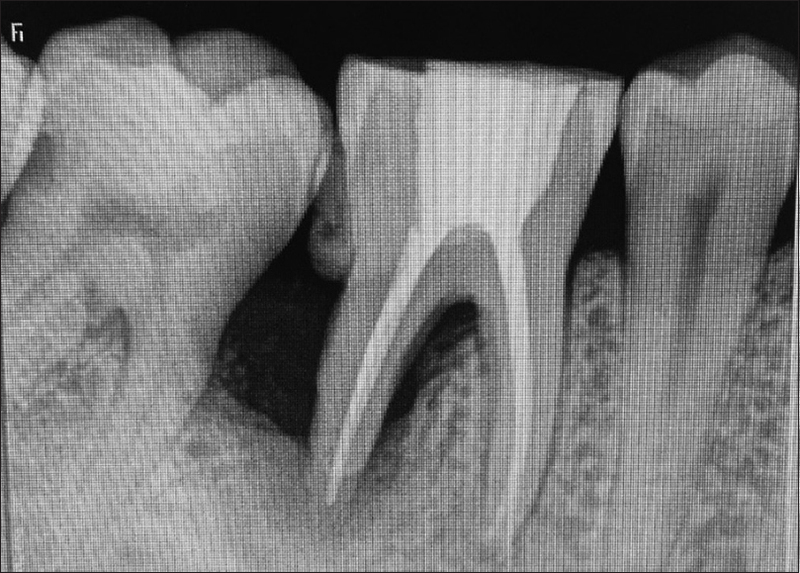 A well-circumscribed periodontal defect was observed around the distal root of 46 with furcation involvement [Figure 5]. Following this, a thorough scaling and root planning was carried out on the exposed root surface area of the defect to remove any remnants of calculus present and also to remove the smear layer on the root surface, respectively. Doxycycline was used as a root conditioning agent. Osseo graft, a xenograft that has both osseoinductive and osseoconductive properties was used as a graft material of choice to fill the defect. Platelet-rich fibrin (PRF), a second-generation platelet concentrate was obtained by withdrawing 20 ml of blood from the antecubital vein and centrifuged at 2800 rpm for 12 min was used in conjunction with bone graft material [Figure 6]. Primary closure of the flap was achieved with nonresorbable silk suture (3-0) using direct loop suturing technique. The patient was given proper oral hygiene instructions and was prescribed 0.12% chlorhexidine mouthwash for rinsing twice daily. The patient was treated with regular recall visits at 1, 3, 6, and 9 months. It was surprisingly found that the probing depth has reduced from 9 to 3 mm. The postoperative radiograph showed bone fill in the periapical region [Figure 7] and [Figure 8]. Dental pulp and periodontal tissues are closely related that are ectomesenchymal in origin. The proximity of both dental pulp and the periodontium is the cause for endo-perio lesions. It occurs either through the apical foramen, accessory canals, and dentinal tubules of the root of the tooth and it can interface the integrity of the other. Although there are several routes of communication of infection, the direct transmission of the periodontal infection to the pulp is always controversial. 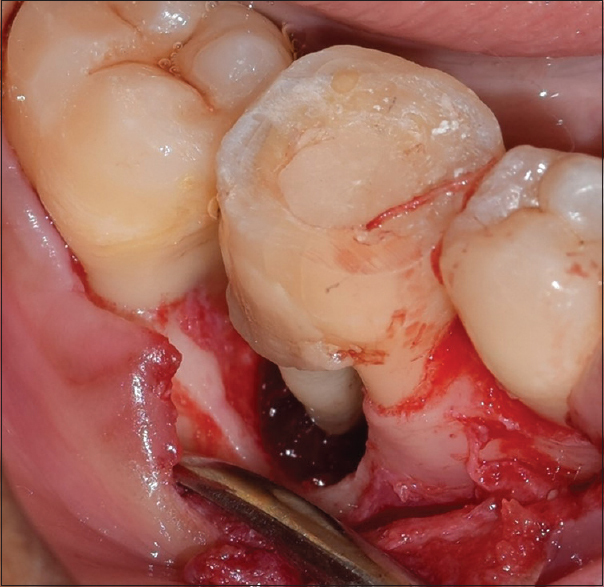 This case report of a patient with aggressive periodontitis with periodontic-endodontic lesion demonstrates that retaining a tooth with poor prognosis is possible when the treatment protocol follows a well-structured and interdisciplinary approach. The ideology of an operator should be to save the tooth rather than to extract it and replace it with dental implants. Considering implants, the previous history of the periodontal disease should be evaluated, and if present it can be further considered as a risk factor for the future periimplant disease. The tooth with poor prognosis can be increased to a higher level by maintaining good oral hygiene and compliance of the patient. When the comparison of survival rate was made between the endodontically treated teeth with poor prognosis and an implant placed in previously diseased site showed that the survival rate of endodontically treated teeth is comparatively higher than the implants. Pulp vitality and type and extent of periodontal defect have to be considered before making a decision of treatment. The differential diagnosis of endodontic and periodontal diseases is always challenging, but a correct diagnosis has a pivotal role so that appropriate treatment can be provided. Many studies in the literature indicated that combined endodontic and periodontal therapy is required for successful healing of a periodontic endodontic lesion. It was mentioned by Schilder and Simon and Jacobs that treating either of the endodontic or periodontic problem will not give a satisfactory prognosis., It was proved that persistent periodontal lesion will heal only after successful endodontic therapy. It was well known the fact that both forms of therapy sequentially are essential for the successful healing of these lesions. It was agreed that pulpal disease if left untreated will cause the periodontal lesion. Few authors said that the periodontal disease that still remained after unsuccessful endodontic therapy, healed after successful endodontic therapy. Simring and Goldberg stated that successful endodontic therapy is required in case of terminal periodontal disease which does not respond to the periodontal therapy. Harrington et al. 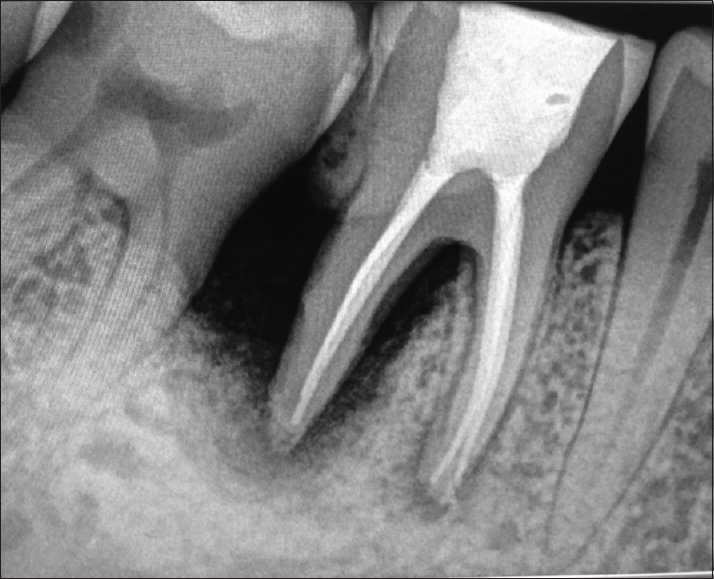 stated that in the case of perio-endo lesion, endodontic treatment should always be followed by periodontal therapy. The reason behind this was that endodontic treatment provides sufficient time for periapical healing thus enabling a better evaluation of the periodontal conditions. Surgical intervention of periodontal condition is done when the endodontic procedure as well as nonsurgical periodontal treatment failed to heal the condition. In this report, vitality test showed the nonvital nature of the tooth suggesting endodontic involvement. Hence, initial endodontic therapy should be emended which results in healing of endodontic component, and the prognosis would finally determine the amount of periodontal repair/regeneration caused due to either of the procedures. 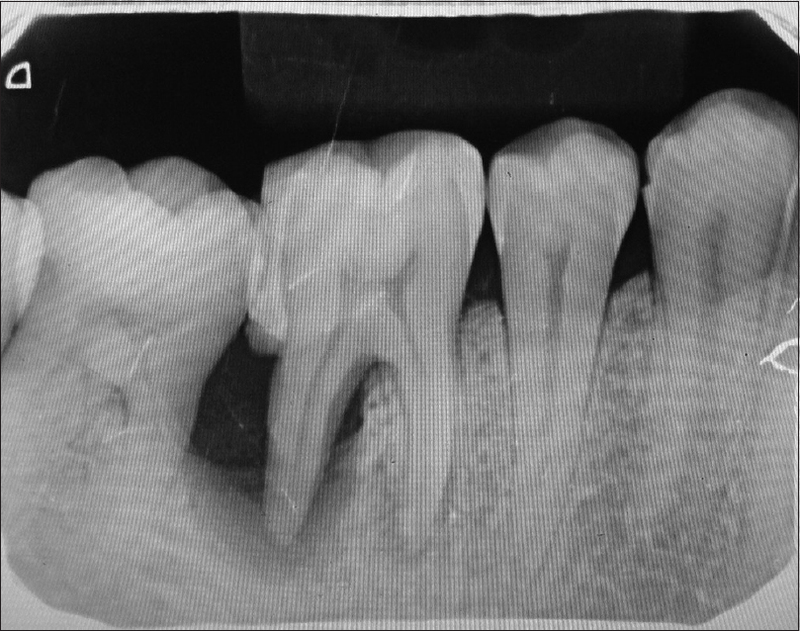 In this scenario, review after 1 month following endodontic therapy does not give the satisfactory healing surrounding the root surface in terms of bone formation and reduction of pocket. This suggests that periodontal intervention was needed to completely eliminate the disease. The diagnosis and classification of periodontal disease were carried based on various clinical and radiographical parameters such as the presence or absence of any clinical signs of inflammation, age of the patient, probing pocket depth, clinical loss of attachment, patient's medical and dental history, presence or absence of any miscellaneous signs, and the radiographic alveolar bone loss and the type of loss. 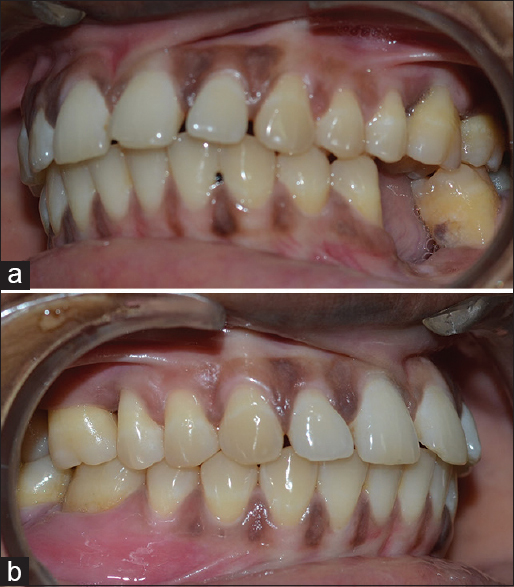 This case report demonstrates an interdisciplinary approach that resulted in the improvement of both clinical and radiographical parameters which in turn achieved health, comfort, esthetic, and function of the tooth. The treatment should follow a strict regimen in treating the disease. In addition, maintenance phase with good patient compliance with bring good improvement in the prognosis of the teeth further by withstanding for longer periods. Further research is needed to evaluate the survival rate of a treated periodontic-endodontic lesion tooth caused as a result of aggressive periodontitis which will guide for better treatment approaches. Joshipura V, Yadalam U, Brahmavar B. Aggressive periodontitis: A review. J Int Clin Dent Res Organ 2015;7:11. Solomon C, Chalfin H, Kellert M, Weseley P. The endodontic-periodontal lesion: A rational approach to treatment. J Am Dent Assoc 1995;126:473-9. Glickman I. Clinical Periodontology. Philadelphia: Saunders; 1953. Renvert S, Quirynen M. Risk indicators for peri-implantitis. A narrative review. Clin Oral Implants Res 2015;26 Suppl 11:15-44. Axelsson P, Nyström B, Lindhe J. The long-term effect of a plaque control program on tooth mortality, caries and periodontal disease in adults. Results after 30 years of maintenance. J Clin Periodontol 2004;31:749-57. Pjetursson BE, Thoma D, Jung R, Zwahlen M, Zembic A. A systematic review of the survival and complication rates of implant-supported fixed dental prostheses (FDPs) after a mean observation period of at least 5 years. Clin Oral Implants Res 2012;23 Suppl 6:22-38. Schilder H. Endodontic-periodontal therapy. In: Grossman L, editor. Endodontic Practice. 6th ed. Philadelphia: Lea and Febiger; 1965. Simon P, Jacobs D. The so-called combined periodontal-pulpal problem. Dent Clin North Am 1969;13:45-52. Hiatt W, Amen C. Perioodntal pocket elimination by combined therapy. Dent Clin North Am 1964;133:44. Johnston HB, Orban B. Interradicular pathology as related to accessory root canals. J Endod 1948;3:21-5. Simring M, Goldberg M. The pulpal pocket approach: Retrograde periodontitis. J Periodontol 1964;35:22-48. Harrington GW, Steiner DR, Ammons WF. The periodontal-endodontic controversy. Periodontol 2000 2002;30:123-30. Storrer CM, Bordin GM, Pereira TT. How to diagnose and treat periodontal endodontic lesions? RSBO 2012;9:427-33. Fahmy MD, Luepke PG, Ibrahim MS, Guentsch A. 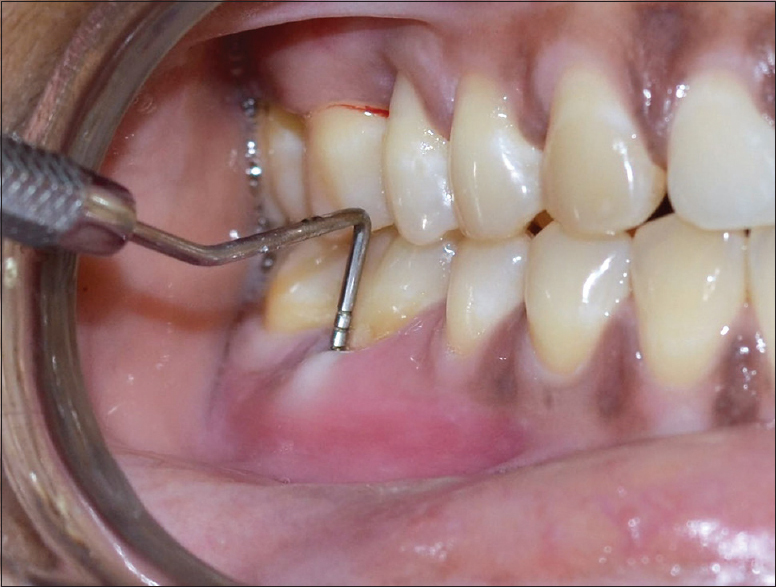 Treatment of a periodontic-endodontic lesion in a patient with aggressive periodontitis. Case Rep Dent 2016;2016:7080781. Cortellini P, Stalpers G, Mollo A, Tonetti MS. Periodontal regeneration versus extraction and prosthetic replacement of teeth severely compromised by attachment loss to the apex: 5-year results of an ongoing randomized clinical trial. J Clin Periodontol 2011;38:915-24. Chandradas ND, Ravindra S, Rangaraju VM, Jain S, Dasappa S. Efficacy of platelet rich fibrin in the treatment of human intrabony defects with or without bone graft: A randomized controlled trial. J Int Soc Prev Community Dent 2016;6:S153-9.